I love good beer. I also love enjoying good beer with my wife and dog. I therefore really love doing both together. Unfortunately, that is not always possible (unless done at home). Hence, the following series. 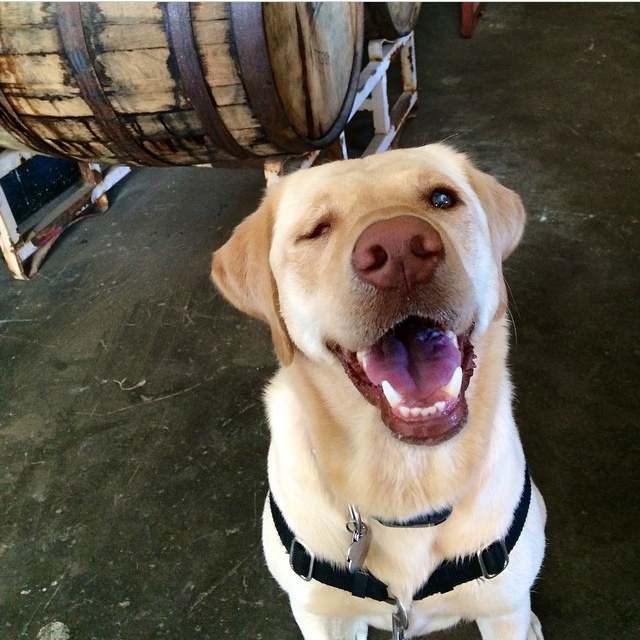 I cannot profess to know every single dog friendly brewery in the state, but I do believe I have a pretty good grip of the best ones in a few different areas, namely SF, the Bay Area and north, and the Central Coast. This series will pass along my knowledge on this ever so important topic. Naturally, the first in this series will focus on dog-friendly breweries in my backyard, San Francisco. These are in no particular order, just how they came to mind. EDIT – Since writing this blog, a few more dog friendly breweries have opened, including Harmonic Brewing in the Dogpatch and Black Hammer in SOMA, reviews on these to come in the immediate future. I was pretty pumped when I first learned Southern Pacific was opening. New brewery? Score. Patio? Double score. Fish and chips and bar food. Boom. Southern Pacific is in a cool old warehouse that has been converted into a fairly huge brewery, restaurant, bar. Located at Treat and 19th in the Mission. We go to Southern Pacific pretty often. On a nice day, sitting on the patio with the dog is tough to beat, but it can get busy. Pros, great food. Fish and chips are bomb, veggie burger and sage fries are solid. Mac and cheese, rotating salads, most everything has been good if not great. It is also a pretty fun place if you are just trying to get a little hammed. Good hard alcohol options and pitchers. A few birthday parties/gatherings have been memorable, at least according to those who remember them. Water bowls for dogs and side chicken breasts keep the pup occupied. Cons, the beer they brew is not great. The IPA is ok, but I usually get the pale. However, it is pretty cheap. Even better, they usually have several other options (read, other breweries) on tap. Last time, they had Tricerahops. Can’t complain. Beach Chalet is another perfect good weather day/dog boozing spot. Go for a cruise on the beach, get the dog exhausted, then kick back a few. Beach Chalet is across from the main parking lot at Ocean beach and at the base of Golden Gate park. The beach across the way is super dog friendly and you can even walk all the way to Fort Funston to really earn the beers. The dog friendly area is out back in the lawn (which is actually Park Chalet, Beach Chalet is the fancier spot inside upstairs). It is self seating, and there are servers. Getting a seat can be a little tough at times. Servers sometimes are swamped, and getting beers for yourself tends to be easier. The beers are pretty decent, not going to blow your mind but certainly good enough. Food is the same. Nothing special, but consistent, decent pub grub. Crab sandwich is my favorite thing. Wife likes the veggie burger and Caesar. There are always a ton of dogs here, chilling in the grass. Plenty places to quickly take them for a walk if they get cranky. Biggest con, it is a trek to get out there from our end of town. Smokestack is the new kid in the dog friendly pack. Smokestack is in the Dogpatch on 3rd and 22nd. It seemed to take forever to open, with countless delays, but now we get to enjoy it. Smokestack is part of Magnolia, and I have only seen the Magnolia beers on tap. They also have a pretty solid cocktail selection. Beer is solid, rotating Magnolia options. Smokestack on its face does not seem like a dog friendly bar. There is no obvious patio. However, in the brewery dock along 22nd you can have the pup. The website says this is “sometimes” open, but everytime we have gone during the DAY, it has been open. Last time I was there at night it may not have been open, but bringing the dog is more of a day drinking thing anyway. We have actually never eaten here, but people tell me the BBQ is good, although pricey. The meat is sold by weight and seems to change often. PS. After Smokestack you can go across the street to the Dogpatch Saloon, which allows dogs inside, for a good beer and whiskey selection. PPS. Go grab a pizza from Longbridge first and bring that to the saloon. I am including Rogue on this list because they have a taproom (or as they call it, a “meeting hall”) in North Beach that has a big dog friendly patio. It is not technically a brewery IMO as they do not brew in SF, but this is my blog and I say it counts. Rogue always has interesting beers on tap. At the SF location, there is no shortage of options. I try to try something new every time I go. The dog friendly area is the big patio out back. Full service, and can get pretty busy. But, this is a good “drinking with the dog at night” spot. Food is pretty decent, tots are always a good choice. We do not make it over here all that often as it is a trek with the dog. We can walk there, but then typically will want to get a cab/Uber home, which can be a little more difficult with the pooch. As I write this I am a bit surprised I have only been to Triple Voodoo once. A dog friendly brewery that is a ten minute walk from home? You would think I would be there every week. However, dog friendly boozing tends to be better outside for me, and Triple Voodoo only has indoor seating. At they do allow dogs indoors. Triple Voodoo does not have food, hence the dogs are allowed, but you can get food from the Mexican spot next door. Their beers seems to be getting better to me, as when they first opened there was not much I liked. The Anarchy IPA is pretty good right now. They only have beer, so be warned if you bring a wine-o or cocktail fiend. One thing that is really cool about Triple Voodoo is they seem to have rescue dog events on a fairly regular occasion. Drinking for a good cause is always great. 21st is one of my favorite spots in the city. Great beer, solid food, and I can walk there and stumble home. Like it so much we had our wedding rehearsal dinner there. Open bar of course (think they lost money that night). On occasion, 21st uses De Boom Street (yes that is the name) as an outdoor seating area. When they do this is somewhat of a mystery to me, so we never know if we can go unless we call or walk over. During baseball season, it is often open, but is very crowded, making it tough for the dog. However during the off season or non game days, it is a great choice. Sometimes there are servers, other times you need to order at the bar inside. 21st always has interesting and good beers, in addition to the usual suspects (Brew Free or Die IPA is always a reliable option). Food is good, mostly typical bar food like burgers, fish tacos and pizza. Nothing really particular stands out, just depends what I am in the mood for. They also have a TV outside, but there is only one, and it is a little small and hard to see with the glare. Live music happens a handful of times of year, which is great. Apparently they want to do it more but it is inanely expensive to get the City approval yaddy yaddy yada. I wrote a good chunk of this blog over the last week or two, but now there is a new one to add! The Yard at Mission Rock is a cool pop-up village across McCovey Cove from AT&T. The biggest draw, by far, is the Anchor beer garden. A decent sized beer garden with 13 (!) 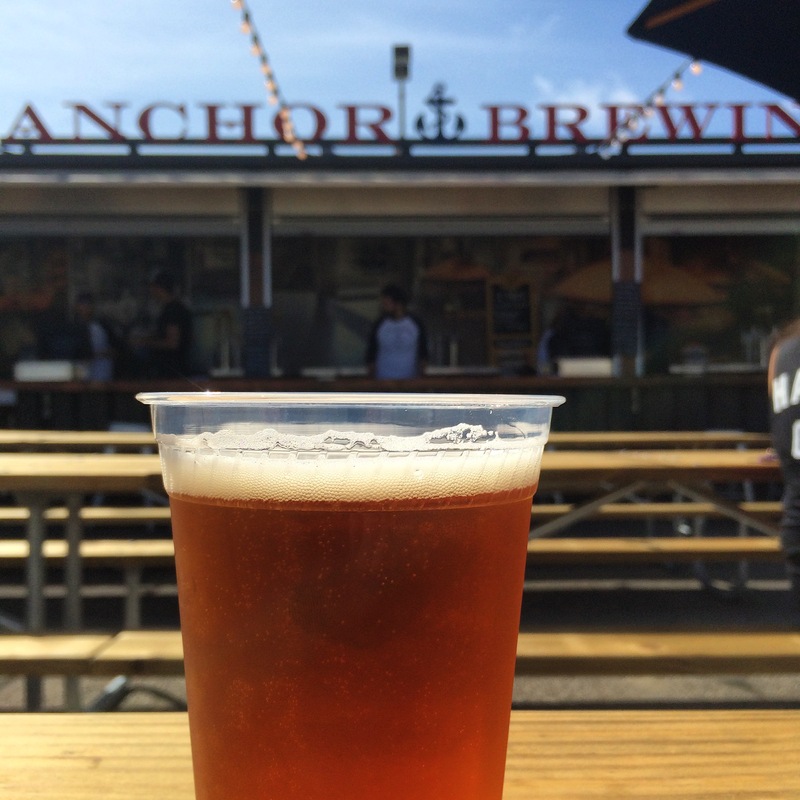 Anchor brews on tap. The beer garden is a preview of what is to come in this area, with Anchor expanding to have a new brewery, restaurant etc. over here that is supposed to quadruple their production. The people at the beer garden tell me they will try and have all the new releases and harder to get beers here. The Yard is made up of mostly shipping containers, with a few food trucks, a wine bus, and a coffee cart. “Whole Beast” shares the beer garden and has a decent selection of food. You can also grab food from one of the food trucks and bring it into the beer garden. There is no wine or hard alcohol in the beer garden area, and there are a ton of signs that say you cannot bring outside beverages in. This is not ideal for the wife, who wanted to have some wine. Hopefully this will change. In any event, I see myself here often. Super close, Anchor makes great beer, and great bay views. They also have a couple TVs outside, which is dangerous. Beer, dog, wife, outside, AND basketball games? Uh oh. Am I missing any? Let me know in the comments!